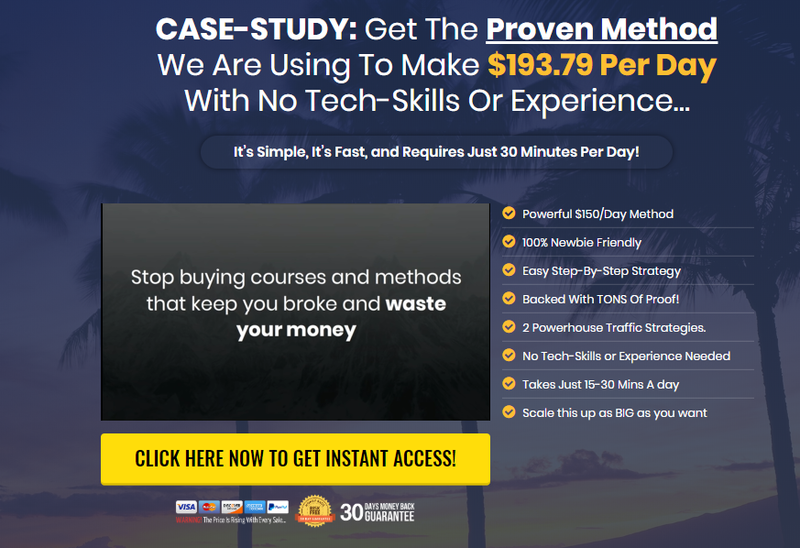 / Profit Raider Review – Scam Or Legit Way To Make $100 A Day? Quick Summary: Profit Raider is an affiliate marketing training platform that focuses on email marketing. 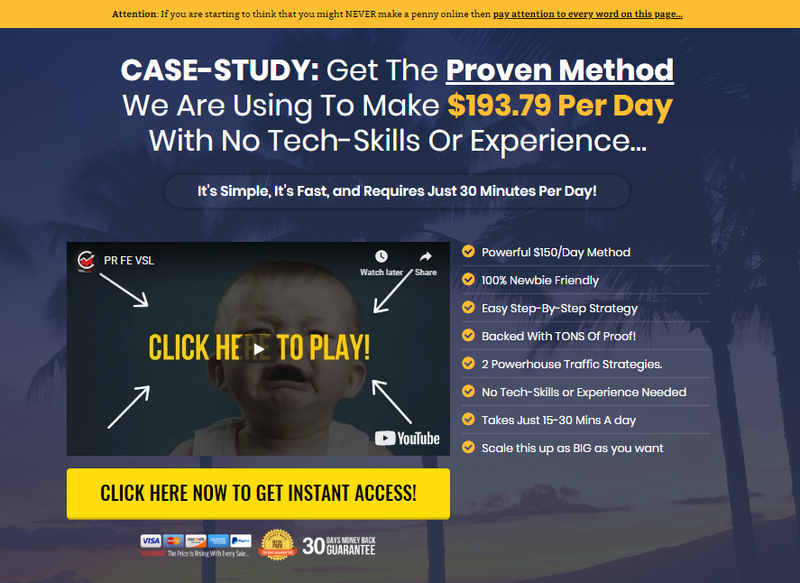 It claims to help you earn $100 a day even with no expertise or skills required. But how true are these claims? Is Profit Raider just another scam to watch out? These are just some of the usual things I read on most programs claiming that they can help you make massive amount, in just one day. While I know it’s possible, these phrases, when mixed together, are just too bold. First of all, knowledge, experience, and time are extremely important when you want to create an insane amount of money. You just can’t get rich OVERNIGHT no matter how revolutionary you think the system is, just like what Profit Raider is claiming. Still, it’s too early to assume that this program is inefficient so I decided to make an honest review about Profit Raider find out all the good and bad about it. What Is Profit Raider About? Profit Raider an A-Z online training program that takes advantage of Bing Ads to generate traffic to one of its two sales funnel. Basically, it helps you earn money through affiliate marketing. Now, you might be wondering what A-Z means but I assume that what this system is trying to tell you is that it has every single thing you need to make money using this business model. Before we go on, I just want to clarify a few things. First, affiliate marketing is legal and it does work. A lot of people still find this money-making opportunity skeptical, probably because of programs that come with bold claims. The truth is you can create real money here, you can even use it to generate a source of passive income. However, you need to have the knowledge and skills to make it work. Also, it takes time for you to see the results. Going back to Profit Raider, one of the founders, Samuel Cheema, mentioned that Profit Raider is “like nothing you’ve seen before” and that’s just one of the many things I’m dubious about. If this program is something new, then why does it sound and look almost the same as Myriad Profit -- another product launched by Samuel Cheema, Edwin Mik, and Neil Moran. If the founders want to claim such things, I suggest that they at least, exert an effort to create new designs and copies because how would you make people believe that this product works if you can’t even fix the basic things. 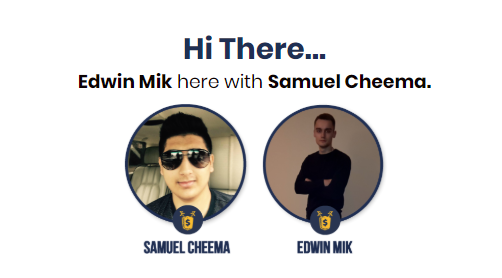 Who Is Samuel Cheema And Edwin Meek? Samuel Cheema, the founder of Cheema Marketing, is an internet marketer and entrepreneur who has launched training courses and products online. First of all, he’s a real person who’s not using any pen name. For me, it’s a relief since most programs with exaggerated claims I’ve seen have never shed any details about their founders and/or company. Edwin Mik, on the other hand, is an affiliate marketer who has also developed and launched training programs for making money online. These two have collaborated and founded several products together. Is Profit Raider A Scam? Although the sales page is almost similar to low-quality products or scam, Profit Raider is legitimate. The people behind it are also real people and you can easily find more details about them online unlike other sketchy products that share little to now information about themselves. The problem is, Samuel and Edwin made money making sounds so easy when in reality, it’s not, and I believe that the founders know that. But probably, for the sake of marketing, they’ve used bold claims to attract customers, such as earning $100 a day without experience. Whether you have a regular job or you’re managing your business online, you probably know how challenging it is. If you have little to no expertise or knowledge about what you are doing, it will not simply work out. It takes hard work, commitment, and consistency and any program that promises to help you get wealthy overnight is more likely to be a scam. However, there are still good quality products that are using bold claims to attract customers but despite the quality programs they have, they will not be able to help you get rich in just one night. So it’s important that you keep your expectations low so you’ll not end up disappointed. To be safe, it’s best to stick to methods that are transparent with their offers, such as my top recommended program. This system provides a lot of perks such as free membership and training but the best part is, you’ll be joining an active community that will encourage you to start and grow your business online. 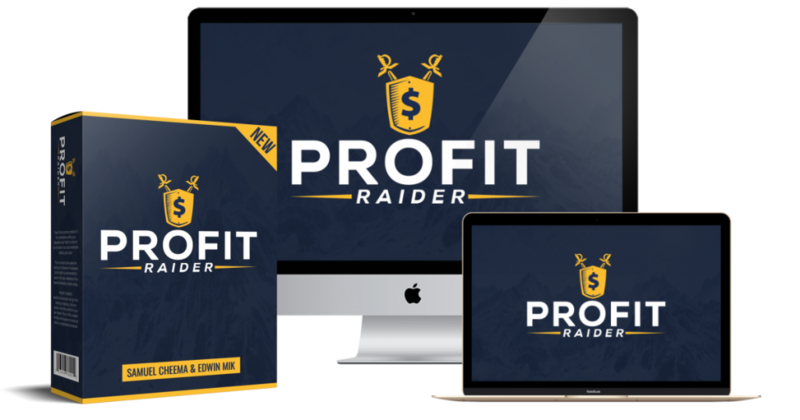 Initially, Profit Raider costs $12.95 but before you see the actual training, you will be introduced to 4 upsells. While it’s usually irritating to see add-ons, these are only optional and you can go on and start earning even without purchasing the additional products. Plus, in case you want to try each and you felt disappointed afterward, you can have it refunded -- thanks to their money-back guarantee. On top of this, there’s another upsell you need to purchase to run your email campaigns so expect to pay a little more than the initial price. Despite all the false, exaggerated claims, Samuel Cheema and Edwin Mik have proven a lot of things when it comes to training and Internet marketing so more or less, the training they offer in this method is valuable and can be used when you want to grow your business online. It only costs $13 and although there are upsells, the basic package is enough to get you started. If you’re new to this kind of strategy, you may fall easily to their promises and expect that you will earn a massive amount in just one day. The thing is, no matter how good a program is, it takes time to make the method work. Having expertise and experience are not really cons; in fact, these are advantages. However, this program will make you believe that you can start earning even if you know nothing about it. The truth is, there are “jargon” or specialized words used in the training and if you don’t know what it means, you have to read or learn about it on your own. You need to purchase Clickfunnels for your email marketing plus, you will be bombarded with 4 upsells before you begin the training. Although these 4 are optional, you might get lured easily to buy this right away. Profit Raider is ideal for those who have experience with affiliate marketing. The training is good enough but still, it contains jargons and methods that might confuse beginners. You can make use of this program to improve your knowledge and skills. This program focuses on email marketing and if you haven’t tried this method, you can take advantage of Profit Raider to enhance your skills in this area. If you’re a beginner, you can use this as long as it’s okay with you to read and learn on your own. Some words may be too technical so you need to spend additional time learning about this. However, if you want a real beginner-friendly program, I suggest that you sign up with Wealthy Affiliate. Apart from the training provided, you can have access to a supportive community. You can ask questions or advice from fellow marketers on how you can grow your business online. Profit Raider’s training focuses on using email marketing as well as setting up funnels. You will also learn how to use Bing keyword planner to create effective campaigns and an overview of a free traffic method through Facebook. In addition, Profit Raider will also discuss how to choose products from JVZoo and Muncheye to promote. Profit Raider is not a scam. It’s a legit training platform with very basic knowledge about email campaigns and affiliate marketing. If you’re a beginner, I cannot recommend this platform for you because instead of learning, you might end up more confused. Plus, you’ll have to spend more than just the training itself. For me, it’s not practical knowing that you can find valuable programs for free. Also, Profit Raider has been misleading all along. You just can’t earn money -- an insane amount of cash -- in a short time, not even with the right knowledge and skills. Like other businesses, it takes time to gain trust from people, let alone for visitors to visit your page, and that’s what you should remember when starting a business online. No commitment, don’t worry! I know how much you hate that. Just visit it and see for yourself why more and more marketers switch to this program. Hope I have enlightened you with this Profit Raider review and should you have any question or comments, please feel free to share it below.